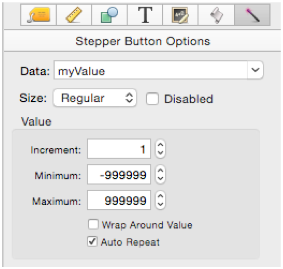 Stepper objects allow a numerical value to be incremented or decremented. Stepper objects don’t display any data, they are usually used in combination with a Text Editor Object, as shown here, or with a Text Display Object. Start by dragging a slider button object from the Object Library to the form. Then enter the name of of the field or variable that will be linked to the stepper (in this example, myValue). Another way to create a stepper is to use the Construct>Fields and Variables dialog, which can automatically add a stepper to an item simply by adding a <step> tag to the template. See Automatic Form Construction to learn more. This option specifies the data that is to be modified by the stepper. You can either type in the name of a field or variable, or you can choose a field name from the pop-up menu (on the right). Panorama will also auto-complete field names as you type. Steppers may be one of three fixed heights: Regular, Small and Mini. These are the only sizes available – see Cocoa Objects for more detail about the reasons for this limitation. This option disables the stepper. When the stepper is disabled it is dimmed and it can’t be clicked on. Of course there is no point in a stepper that is permanently disabled. So normally you would enable/disable a stepper with a procedure. See Push Button Objects for an explanation of how a procedure can enable/disable an object. This is the amount by which the value will be increased or decreased when the stepper is clicked on. The default is 1 but you can use any value, including fractional values. These values specify the stepping limits. If the value is already at or above the maximum value, or at or below the minimum value, clicking again will not change the value. However, if the Wrap Around Value option is checked, clicking will “wrap” when it reaches the limits. If this option is checked, clicking and holding down the mouse will cause the stepper to repeat a few times a second as long as the mouse is held down. If this option is turned off, the value will increase or decrease only once per mouse click, no matter how long the mouse is held down.